Portable, ultra-light table. 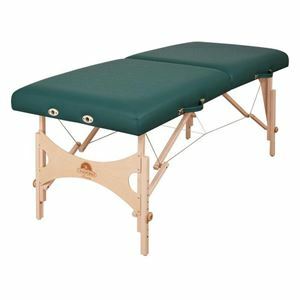 Special frame, leg and brace designs offer a full 6” recess at the ends of the table so that the therapist has plenty of leg room. Features semi-firm padding with abrasion and stain resistant Sierra Doeskin upholstery. Height range: 24-34”; length: 73”; width: 28”; working weight: 400 lb. Face rest and carrying case available separately.